Beat eggs with a fork. Preheat oven to 140 Celsius. 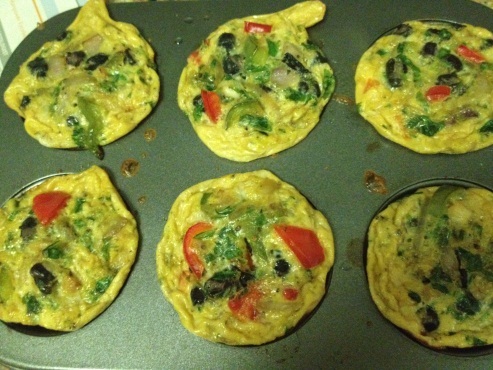 Pour into muffin pans and bake for 15-20 mins or till done. You can saute the vegetables first before adding to beaten egg. You can make this in a pan on stove top. Cut into wedges and serve. Boil chicken breast in little water with salt, pepper and turmeric powder. Drain excess water when done. Mince it in a food processor or chopper. Mince garlic, ginger and green chilies together. Heat oil and saute chopped onion. When it turns translucent, add minced garlic, ginger and green chilies. Saute till the raw smell goes. Add curry leaves and stir. Add chicken mince and garam masala. Stir for few minutes and take off fire. When it cools, add mashed potatoes and mix well. Add a beaten egg and mix again. 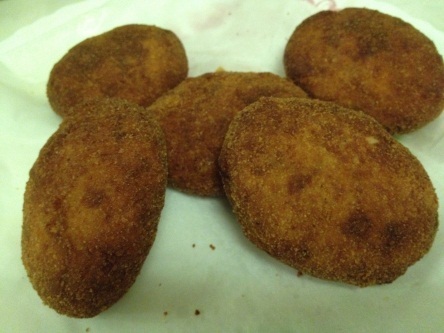 Shape into cutlets or small balls. Dip in beaten egg and roll in breadcrumbs. Heat oil and deep fry. You can freeze the extra ones. Freeze in a single layer on a plate and then stack them in a container or ziplock bag. Chicken cutlets are not on the soft side like meat. If you have difficulty making shape, add more beaten egg, a little at a time. You can add pepper powder if you wish, but I usually don’t for any cutlets. Cutlets made with only green chilies for spice have a unique taste. 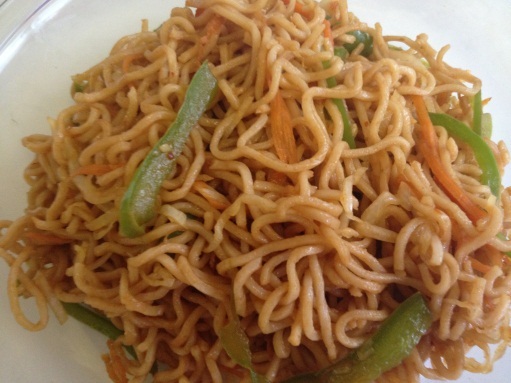 You can use either egg noodles or two packets of 2 min noodles. Heat oil in a large pan and add garlic. Saute for some time. Add onions and capsicum and stir fry on high heat. Add rest of the vegetables and stir for a few minutes. Add noodles, chilli flakes and salt. Mix well and serve hot.